Liquid finishing tools require process air for atomization of the coatings. Properly designed pressure panels incorporate high quality components to provide repeatable flow of air to the tool. Depending on the spray gun, pneumatic processes can include atomization air adjustment, pattern air (fan air) adjustment, turbine air (electrostatic voltage) and fluid flow regulator pilot. 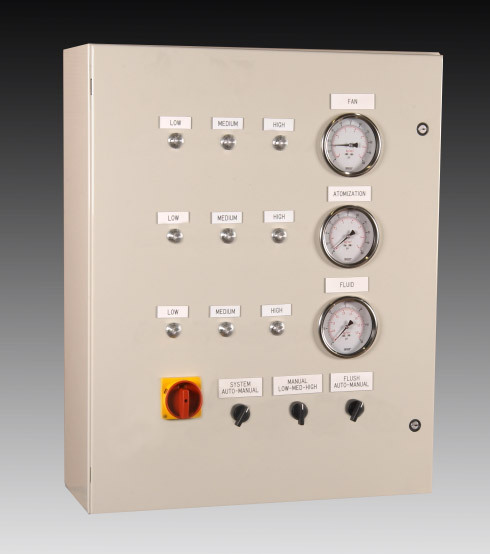 Pressure panels can include either manually adjustable process regulators, electrically activated multiple set point, or electronically adjustable regulators.